Removes up to 100% of dirt, grease & grime. Flash One for All offers you a universal solution for your entire home. Powerful multi surface cleaning. Leaves intense freshness and brilliant shine. Cleans in cold water, saving energy. Available in multiple scents. 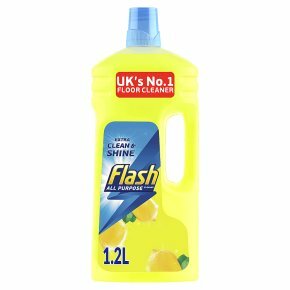 Flash Multi Purpose Cleaner is perfect for cleaning almost any hard surface in your home. Use it on the kitchen sink, greasy stovetops, even as a floor cleaner. See package for full usage instructions. A rinse is required for surfaces in direct contact with food. Causes serious eye irritation. Keep out of reach of children. If medical advice is needed, have product container or label at hand. IF IN EYES: Rinse cautiously with water for several minutes. Remove contact lenses, if present and easy to do. Continue rinsing. Contains Benzisothiazolinone. May produce an allergic reaction.